Up next on the leaked cast list from the Spider-Man: Homecoming movie, is the first appearance of Ned Leeds in The Amazing Spider-Man #18. Ned plays a pretty important role in the world of Spider-Man, as he would eventually become one of the characters to suit up as the super villain Hobgoblin. That doesn't come until much later, so I'll get more into that in my next post. For now, we'll stick to who Ned Leeds is as he pertains to this issue and his other early appearances. In these early issues, he started out as a rival love interest of Betty Brant, who is also the love interest of Peter Parker. In this issue, Peter is caring for is very ill Aunt May. He is being called a coward by everyone, especially J. Jonah Jameson, because he is avoiding confrontations with all of the villains in the city because he doesn't want to leave his ailing aunt all alone if something were to happen to him. During this time, Peter is also avoiding Betty and she becomes upset with him. Then she meets Ned and the awkwardness begins. Ned Leeds is a journalist at the Daily Bugle, the same newspaper that Betty works at. After the breakup between Betty and Peter, Ned comes into the picture and takes Peters place as Betty's boyfriend. As time went on, he eventually proposes to her and they get married. CGC notes this as the first appearance of Ned Leeds, however it should probably only be considered a first brief or first cameo appearance, since he only shows up in two panels of this issue. We'll have to see whether this changes in the future. He isn't even named until the next issue in ASM #19, when he is finally introduced to Peter. This issue also has the third appearance of Sandman. I have yet to write about him, but I will get around to it eventually. All I ask is for a little patience. So many key issues and so little time. And speaking of CGC, lets take a look at some census numbers. To date, there are 1,163 copies listed on the census. Most of these copies are solid mid to high grade 6.5F+ to 8.0VF. There are quite a few high grade copies as well. There are 175 copies between 9.0 VF/NM to the highest grade 9.8 NM/M, which is only three copies. There hasn't been anything drastic in way of sales skyrocketing recently. I couldn't find any information for 9.8 NM/M copies, but there are a few sales for 9.6 NM+. 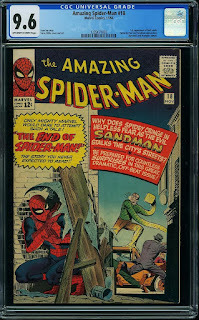 The latest CGC sale on eBay, which was in July of 2015, ended up selling for $4,529.43. That is only up from $4,200 in 2013, which is still a good chunk of change. There was also a sale on ComicLink that recently sold for slightly more than that at $4,636. 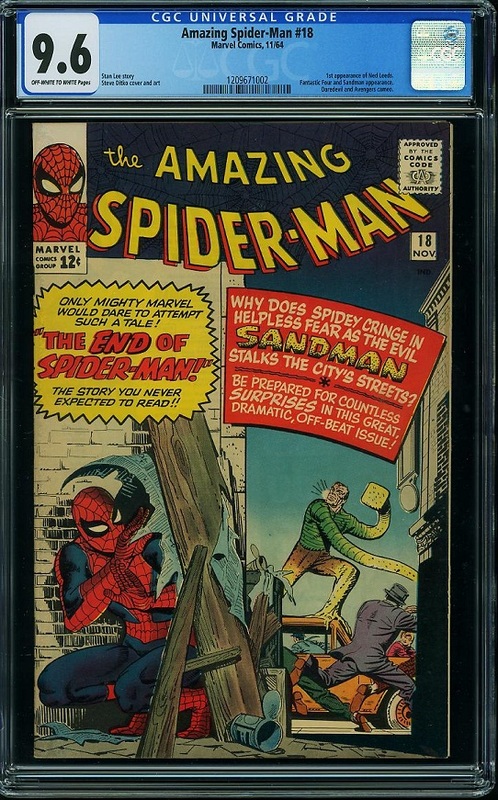 Now, that is a lot of money for a high grade copy, but if you're looking for something that is a little more affordable (depending on what your definition of affordable is) you only have to go down a few grades to a 7.0 F/VF copy. You can probably still snag a copy at this grade for under $300, or if you're really lucky, under $200 like some lucky guy did on Aug 10 of this year. If your idea of affordable is a little higher or lower than that, then you can either go a few grades up or down, depending on what you can afford. There is a nice 9.0 VF/NM copy available here for less that recent copies have been selling for. If you're interested in a high grade copy, you might want to think about this one, while it lasts anyway. Marvel could have some interesting things in store for their cinematic universe by adding this character into the movies. Are they setting up something big like having our favorite webslinger go up against Hobgoblin in the future? Or is he just going to throw a wrench into Peter Parker's love life like he does in this issue? Only time will tell.